It's no secret that Kelsey and I love Lizzy House's fabric. A quick look at our stashes will reveal that we have at least a few prints from every collection. 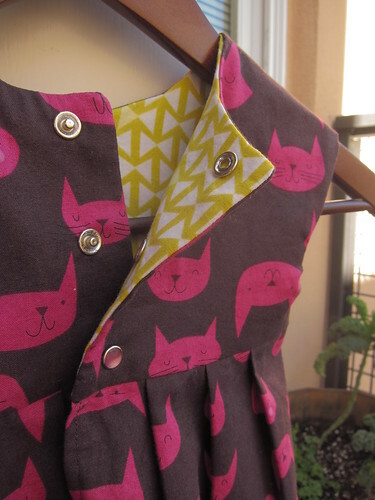 It'll be no surprise to you to hear that when Lizzy announced the Catnap dress contest in January, it took us all of five minutes to pick fabric and plan our entries. 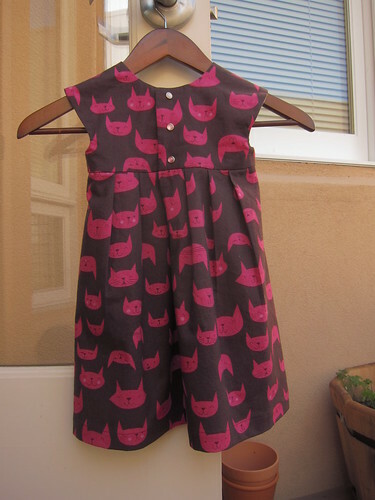 I opted to make a dress for Kelsey's almost 2 year-old niece out of the Purrfectly Happy print in Raspberry using Made by Rae's super cute Geranium Dress pattern. I opted for view B with it's sweet cap sleeves and pleated skirt and added the notched neckline for fun. I used a piece of the Cat's Cradle print in Lemon to line the bodice and a few random Pearl Snap Source snaps I had kicking around to finish everything off. 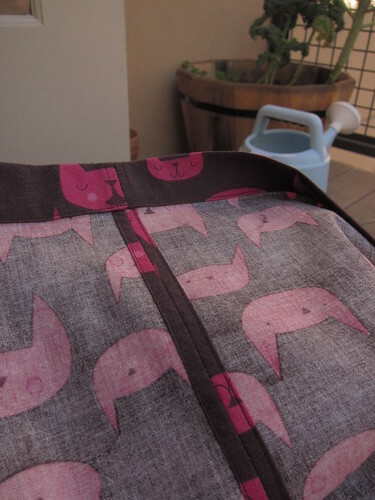 As usual Rae's patterns are wonderful to make. The instructions are clear and there are tons of small details that make the finished product look "properly" finished. It's such a great feeling when something you make is as beautiful on the inside as it is on the outside. Since I didn't have enough snaps in the same colour to finish this dress, I opted instead for an ombre effect, moving from a pale, almost white pink at the top to a hot pink near the bottom. I think after this project I am a snap convert. They look so clean and finished and are SO much easier to add to a garment than buttons and button holes. 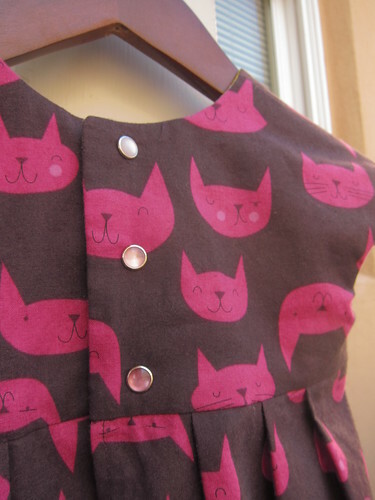 I also think that they'll make this dress a little easier to get in and out of for a certain busy 2-year-old. Sadly no modeled shots of this one since my sweet little model is probably dragging her favourite baby doll around the house up in Canada while I enjoy the sun here in California. Since her second birthday is coming up in the next month, I popped this little number in the mail earlier this week so that she will have it her for her actual birthday (with plenty of time to spare, for once)! Hope this whets your appetite, Kelsey has a big dress reveal planned for tomorrow. It's a stunner so stay tuned! What an amazing finish Amanda. The yellow lining is perfect, and you've finished it all so professionally. Great details, Amanda! Your stitching is fabulous and I love the ombre effect! Oh, this is so cute Amanda! I love that print! And i've been wondering about Rae's dress patterns. A friend of mine just had a little girl and i'm seeing lots of dressmaking in my future! Beautiful! Those snaps are keeeeeeeling me. 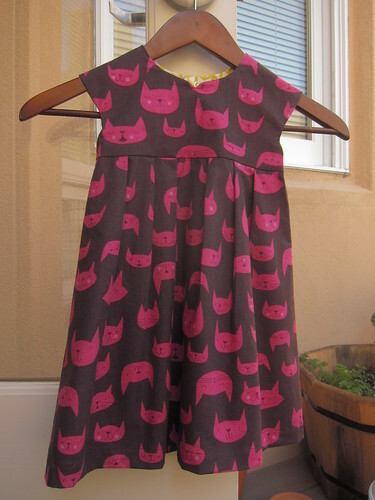 I love the prints you chose too--funky and cool. Even two-year-olds deserve to be a little funky! Great work.